ASHEVILLE NC – The Buncombe County Sheriff’s Office has been notified of a scam involving persons phishing Facebook for information about Facebook users’ families, contacting them claiming that their relations have been arrested, and money is needed to either get them out of jail, or for court fees. Targets of this scam are then instructed to go to Home Depot, obtain gift cards, and load large amounts of money onto them. They are then provided instructions on how to get the cards to the persons requesting them. The Buncombe County Sheriff’s Office advises anyone contacted by someone claiming to be a relative, or someone claiming to be in contact with a relative who is in legal trouble, to first attempt to contact that relative directly themselves. If contact is not made with that relative, contact the Buncombe County Detention Facility to see if that relative is currently being detained there; the number to the Detention Facility is (828) 250-4550. If you have been contacted by someone trying to solicit money from you using this scam, or if you have been a victim of this scam, please call the Buncombe County Sheriff’s Office at (828) 250-6670 to file a report. The Buncombe County Sheriff’s Office would like to remind those using social media to monitor their accounts, utilize the privacy settings available, and use their judgment when being asked to provide money to anyone who they do not know, and who has contacted them out of the blue. ASHEVILLE NC – The City is holding a one-hour informational meeting for businesses that are interested in doing graffiti removal work. The meeting will be held on Friday, June 6 at 10 a.m. in room A-109 in the Public Works building at 161 S. Charlotte Street. Attendees at the informational meeting will learn the qualifications needed to be prequalified to be a contractor. These prequalified contractors will be added to the rotating list to provide graffiti removal services for the City of Asheville. Attendees will also receive the graffiti removal requirements, review a sample contract and fee structure, and receive answers to their questions. Copies of the application will be provided at that time. Applications will be due by 12 p.m. on Monday, June 16, 2014 and can be emailed to [email protected], dropped off at the Public Works office at 161 South Charlotte Street, or sent to City of Asheville Graffiti Removal Application, PO Box 7148, Asheville NC 28802. Applications must be received (not postmarked) by the deadline. Anyone interested in providing graffiti removal services for the City of Asheville is highly encouraged to attend this meeting for further details.A fast moving pool of graffiti removal contractors is an integral part of the plan to eradicate graffiti vandalism in the city of Asheville. ASHEVILLE NC – The Osher Lifelong Learning Institute will hold an advance care planning workshop from 7-9 p.m. on Thursday, June 19, at the Reuter Center, home of OLLI at UNC Asheville. This workshop is free and open to the public. The workshop will feature a panel experienced in addressing end-of-life issues, including workshop coordinators, David Mouw, M.D., Ph.D. and Mary Campbell, BSN, COHN-S. Discussion will include communicating treatment wishes to family and medical personnel, ethical and legal issues, and the uses of advance directives. Assistance will be provided for those wishing to complete a legally valid advance directive, including the notarization required in North Carolina, using the “Five Wishes” format. For more information on the workshop, including suggested things to do and read in advance, visit http://olliasheville.com/special-programs#advance-care-planning or call 828.251.6140. ASHEVILLE NC – The Asheville Wild Birds Unlimited store in Gerber Village will be hosting Carlton Burke with Carolina Mountain Naturalists for a special program on owls Sunday, May 25, 2014 at 3:00pm. This free program will feature a special appearance by some of Carlton’s amazing owl ambassadors. Owls are very mysterious birds of prey seldom seen due to their elusive and nocturnal lifestyle. In this special program, Carlton will share information about the fascinating lives of these unusual birds and their unique adaptations for life in the nighttime world. Carlton is a local naturalist and educator who resides in Mills River where he operates Carolina Mountain Naturalists, an education service which offers live wildlife and nature programs to various groups and organizations. Carlton is also a NC state and federally licensed wildlife rehabilitator. He was on staff as the Curator of Exhibits at the Western NC Nature Center in Asheville for over 25 years and also teaches classes for the Blue Ridge Naturalist Certification program at the NC Arboretum in Bent Creek. Wild Birds Unlimited specializes in bringing people and nature together with bird feeding and nature products, expert advice and educational events. Visit our website at www.asheville.wbu.com. 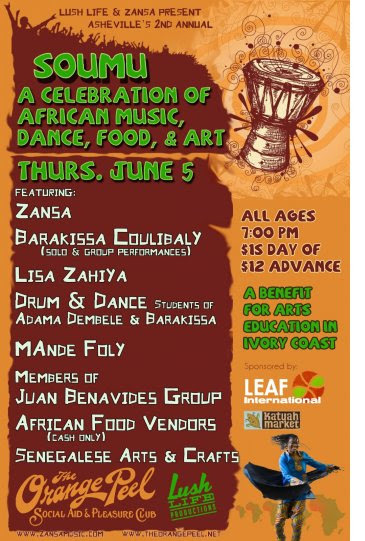 Performing live at the event will be afropop/zouglou band Zansa, featuring Ivory Coast native Adama Dembele, Ivorian dancer Barakissa Coulibaly, African drum and dance troupes featuring Adama and Barakissa’s students, Lisa Zahiya performing folk dances of North Africa and contemporary dances from Cairo, acoustic Zansa side project Mande Foly, and members of Juan Benavides Group. Traditional West African cuisine by Soce will be available for purchase (cash only), as well as Senegalese arts and crafts. ASHEVILLE NC – This month ASAP is celebrating local greens for their Get Local campaign – a year-round initiative that brings together farmers, chefs, and community members to highlight a featured local food. Local greens mean that spring is really settling in and summer isn’t far off. From classic Southern collards with ham to fresh, raw kale salads, chefs get creative with these nutritious leafy veggies. Different varieties of greens are popping up in restaurant dishes and on farmers market tables – think lettuce, arugula, beet greens, and more. Appalachian Grown™ partner restaurant Posana Café has an exciting event planned this month to feature the versatile vegetable and other spring delicacies. For the fifth year running, Posana is celebrating its anniversary by hosting a fundraiser to benefit ASAP’s Growing Minds Farm to School Program. On Thursday, May 22, Executive chef/co-owner Peter Pollay and his team are creating a special Appalachian Grown dinner menu featuring greens sourced from Appalachian Grown certified farms. All of the proceeds from the special menu will support ASAP’s efforts to enable children to have positive experiences with local food. ASHEVILLE NC – Firefly exists to help people of all ages learn how to be functional human beings walking on this earth. Come explore a higher education; one that can actually be put to use in everyday life. One that teaches practical skills, the type we should have learned in school while we were filling our heads with abstract numbers. What we are talking about is re-discovering what your body, mind, and spirit were made for. Exposing yourself to skills that may make your heart sing. You can help make our world a better place and learn to thrive in any environment, no matter the state of the ever-changing world. And you can have fun doing it. Wild foods, gardening, archery, shelter-making, herbal medicine, solar power, relationship skills, bowmaking, animal tracking, Cherokee storytelling, and mead making, are just a few of the classes and activities scheduled for the seventh annual Firefly Gathering being held over the summer, June 12-15, 2014, at Bell’s Cove outside of Asheville. The Firefly Gathering is a multi-day instructional and community-building event in the mountains of North Carolina, offering a diversity of programs to support grassroots sustainability. The weekend features over 200 educational classes for young and old alike, from the arts of our ancestors to classes in modern-day sustainable technology like solar energy, permaculture, and biofuels. A day might be spent making woodcarving, shooting arrows, and sustainable urban gardening, while evenings might be spent “round the campfire,” with other like-minded families and individuals, waltzing, listening to a talk on wild foods, or off doing one’s own thing. All activities at Firefly are optional. Almost 100 master-teachers from across the region are contributing their skills and talents to this event including renowned story tellers, herbalist, crafts people and fiber artist, homesteaders, survivalist, mushroom hunters and Earth educators. Every year we offer awesome programming and classes for all ages… Adult programming, Teen programming (ages 13-17), Kids program (ages 8-12), and childcare. This year we are re-vamping our kids program to make it be more engaging and fun our kids program. Sugi Hodges, from Forest Floor Wilderness programs, will be coordinating the program. It will involve exciting and engaging classes like natural soda mading, kinife safety, natural camouflage, clay bead making, and snake identification. For those who want to go deeper with these skills, post-camp intensives sessions are June 18-21. Intensives include shoemaking, intro to permaculture and eco-homesteading, emergency eedical preparedness, traditional building with timber traming, fiber fantasia and a wilderness survival. Admission is based on a sliding scale and includes on-site camping, facilities and access to all classes. Cabins are available on the website. Pre-registration is highly recommended, as space for camping is limited. To register go to www.fireflygathering.org. ASHEVILLE NC – The Folk Heritage Committee, which produces Shindig on the Green, is excited to announce the third annual Run For Shindig on the Green, a fun and healthy way to help support Shindig, featuring a 5K Race and one mile Fun Walk/Run. The event takes place Saturday, June 28, 2014 at Carrier Park in Asheville with the 5K Race beginning at 8:30 a.m. and the Fun Walk/Run beginning at 8:35 a.m. The Run For Shindig on the Green 5K kicks off the 48th season of Shindig and is a key element in securing necessary funding for the free and beloved Shindig on the Green summer Saturday evenings in Asheville. Two overall winners will be recognized at this year’s first Shindig on the Green, on the evening of June 28th, and all race participants are encouraged to attend. The overall male and female winners of the 5K will each receive a beautiful mug featuring the Folk Heritage Committee logo and handcrafted by Mangum Pottery in Weaverville, NC. There will be additional medals and ribbons awarded to the winners of age divisions of the 5K Race. Post-race snacks and water provided courtesy of Sam’s Club. Race management timing and finish line services are performed by Right On Time Productions; race results will be available five minutes after the last runner finishes. Over 30,000 people attend Shindig on the Green for free throughout the summer. While the crowds of locals and visitors at Shindig have grown over the years for the free evenings, so have the costs. The non-profit Folk Heritage Committee must raise funds to cover the costs at Shindig on the Green for goods and services such as sound equipment and technicians. All proceeds from the June 28th 5K and Fun Walk/Run will help to cover the “free” Shindig’s very real operating costs, which average several thousand dollars per evening. The Folk Heritage Committee produces Shindig on the Green and the Mountain Dance and Folk Festival in order to support the preservation and continuation of the traditional music, dance and storytelling heritage of the Southern Appalachian Mountains. Shindig takes place in the heart of downtown Asheville at Pack Square Park’s Roger McGuire Green, on the Bascom Lamar Lunsford Stage. Dedicated to the celebration and preservation of the region’s rich cultural heritage, Shindig on the Green’s 48th summer season is scheduled for June 28; July 5, 12, 19; August 9, 16, 23, and 30. For more information, visit www.folkheritage.org or call the Folk Heritage Info Line: 828-258-6101 x345. Registration: Registration is open! Register for the “Run for Shindig on the Green” 5K Race and Fun Walk/Run online at www.active.com. Online registration closes Thursday June 26th. T-Shirts will be available for pre-registered participants only. There will be no T-shirts available for race-day registrants. Day-of-race registration is 7:30-8:15 a.m.
Carrier Park: The June 28th 5K and Fun Run fundraiser takes place at Carrier Park at the intersection of Amboy Road and Michigan Avenue in West Asheville. ASHEVILLE NC – Local food sales in Western North Carolina have grown significantly in the last five years. The 2012 Census of Agriculture, released on May 2, shows that direct sales alone have increased by nearly 70% in the region according to analysis by ASAP’s Local Food Research Center, from under $5 million in 2007 to over $8 million in 2012. The 2012 Census of Agriculture also shows that the region has reversed a disturbing trend in loss of farm acres, actually adding over 10,000 acres between 2007 and 2012 while the rest of North Carolina and the country lost farmland. It has been five years since the United States Department of Agriculture released the 2007 Census of Agriculture. In that time period the local farm and food scene in Western North Carolina has undergone a visible and dramatic transformation. “The 2012 Census of Agriculture verifies what we see every day in Western North Carolina – the local food movement is growing,” said Charlie Jackson, ASAP’s Executive Director. “We just never imagined it would be this dramatic.” For over a decade ASAP has worked to build demand for food grown by local farms through their many programs and products, such as the Local Food Guide, Appalachian GrownTM certification and branding, and the Farm Tour. ASAP’s Local Food Research Center has come to the same conclusion as the Census of Agriculture data demonstrates – local food sales are growing and more and more people are seeking out food from local farms. The Center’s own data shows that local farms and locally grown food are defining features of life for the people who live in the region. In every category of local food sales there have been large increase. “Not only have are we seeing these large increases in direct sales, we are seeing more and more restaurants, grocery stores, and even universities, hospitals, and public schools embrace local food” said Jackson. According to ASAP, consumers spent over $170 million on local farm products in 2013, a 42 percent increase from the previous year. All statistics from the table were calculated by ASAP’s Local Food Research Center using data from the USDA Census of Agriculture 2012 and 2007, and the United States Census Bureau’s State & County Quickfacts population estimates. *Direct sales include agricultural products produced and sold directly to individuals for human consumption from roadside stands, farmers’ markets, pick-your-own sites, etc. To find out more about ASAP’s Local Food Research Center, or to read up on their research visit: www.asapconnections.org/local-food-research-center/. To find locally grown food visit www.AppalachianGrown.org or pick up a Local Food Guide. ASAP’s mission is to help local farms thrive, link farmers to markets and supporters, and build healthy communities through connections to local food. ASAP’s Local Food Research Center works to assess the economic, social and environmental impacts of localizing food systems. To learn more about ASAP’s work and the center, visit asapconnections.org, or call (828) 236-1282. You are currently browsing the Asheville NC News blog archives for May, 2014.